The Rock And Roll Hall of Fame is awesome. So, yeah, the time I spent in Cleveland didn’t taught me too much about this city. But, on the plus side, my time at Content Marketing World has helped me learn a few things about content marketing and conference-going in general. I’m new to the world of conferences (this is only the third that I’ve ever attended), and naturally shy, so I’m still trying to figure out the best way of making connections. I’m slowly discovering that it’s helpful to have at least a few people you’d like to meet at a conference ahead of time. It makes it a little less intimidating if you set some specific goals. Because I’m new to this, I set the bar pretty low—I had two San Francisco-based content marketers I wanted to meet (Is it silly that we had to wait until we were across the country to meet in person? Maybe a little, but hey, it worked…) and a few presenters I wanted to speak to at least briefly. This helped take some of the scariness out of those empty blocks of networking times. I had contact information for one San Francisco content marketer, but only a Twitter handle for the other. So when we made plans to meet up, Twitter helped me get in touch and make sure everyone knew where to be and when. It was also fun to see how everyone tweeted about our little meet up before and afterwards. So social media helped us connect, then meet in person, and then affirm that connection afterwards. I can also see us staying in touch via Twitter until the next content marketing event draws us to a new, exotic destination. Because I follow Ann on Twitter, I saw that she was handing out goodies at Content Marketing World, so I tweeted to let her know that I was hoping to get her autograph. She replied and we exchanged a few tweets, so when I actually met her in person, she kind of knew who I was! Social media helped me feel more comfortable being social in person. If you’re shy like me, social media can be a great way of overcoming that initial hurdle and establishing some common ground with strangers so they don’t seem so… strange. Oh, boy, I’m going to do my best not to turn this into a rant. Let’s just say that the internet connection both at my hotel and in the conference center was… less than ideal. There were numerous occasions where I just couldn’t get my phone or my laptop to connect to the internet, which meant that I couldn’t access email, Twitter, or Google docs. I’m still trying to figure out my optimal note-taking and simultaneous social-sharing strategy, but I find that it’s easier to be more thorough with everything when I’m on my computer. And while I love Google docs when the internet is flowing smoothly, they make me want to pull my hair out any time I get that “Reconnecting” box (you know, the one that’s the color of a wan banana). I also kept getting a “Twitter has failed” message on my phone, which was painfully accurate. Thank goodness for my local version of Evernote on my desktop, which pretty much saved the day. Every. Single. Time. What am I trying to say here? Always have a back-up. I’ve been working as a content marketer for a year and a half, so this is a field that is still relatively new to me. Some of the sessions felt a little too large for me—either the speakers had bigger budgets, more buzzwords, or heftier teams to handle all the tasks and initiatives they discussed. Copyblogger‘s Brian Clark and Jerod Morris used the analogy of TV/film and expounded on the importance of having a producer, a director, and talent to lead your content marketing team. This was both inspiring and intimidating. Other presenters talked about their comprehensive, all-encompassing content and social strategies or the projects they’ve accomplished with tens of thousands of dollars (or more). And others just baffled me with terminology and concepts I’d never heard of before. But I’ll take a cue here from Jerod and his concept of “Primility” (pride + humility). At this stage in my career, the whole point of attending these conferences is to learn, so I absolutely should find myself experiencing moments where I feel out of my depth. That’s why I’m there—to expand my mind (or melt my face, as Jason Miller so colorfully put it). I’m happy I had the opportunity to see so many talented presenters (and watch adorable kitten videos—thank you, Shafqat Islam for introducing me to BuzzFeed and Friskies’ Dear Kitten). And I feel both humbled and inspired by all the sessions I attended and people I spoke with. 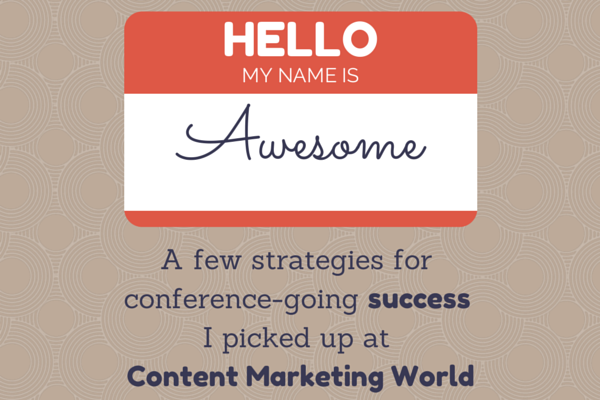 Were you at Content Marketing World? What were some of the lessons that stood out to you? Or, do you have any tips on how to make the most of your time at a conference? Drop me a line in the comments!